The day before yesterday, August 27, was the 238th anniversary of the Battle of Brooklyn, which raged right through Prospect Park. I've written about it here and here, but for a rich and thought-provoking account that asks a key question—"Why the hell is there almost no sign of such a historic battle right in the middle of Brooklyn? "—go here. Olmsted and Vaux’s intention for Battle Pass — topographical preservation, without an ornate memorial — contrasts with commemorations of wars fought beyond the borders of Brooklyn, like the Civil War memorial arch in Grand Army Plaza or the WWI memorial at Lakeside. The Battle Pass approach allows for more open-ended interpretations of history than these nationalistic monuments, but the simplicity of Battle Pass dissatisfied future generations, and more visible memorials were added to supplement Olmsted and Vaux’s memorialization by preservation. Their intention, to imbue an active public space with historical memory, is perhaps too understated to confront our collective propensity to forget. Still, Battle Pass can serve as a prompt to consider how to keep sites of historical memory in the public sphere. If we seek to remember through monumentality, yet fear entrusting our monuments to the private or commercial sphere, we must consider what it means to preserve and act as stewards for our collective history. Two weeks of late May mysteriously land in the middle of March, and I manage not to get over to the park more than once or twice. The reason: My own garden has been bursting out and yelling at me to perform every manner of service for it. A dozen rosebushes alone have been screeching to be pruned, and without the excuse of being miserable in the cold, I have been their slave. But I've got to get over there because all sorts of stuff is going on. From my front porch, I can see that the trees are greening up, smudged with verdant pastel, a full month ahead of schedule. And that's not all. 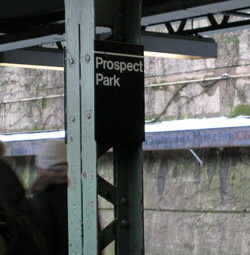 Meanwhile, check out a nicely researched gem on the park's mysterious Vale of Cashmere at the wonderful history blog of the Brooklyn Public Library, Brooklynology. This is the long-gone "Children's Shelter." The Vale, that haunted and troubled gem, looks very different than the playground envisioned by Vaux and Olmsted. Time to get over there and see for myself. 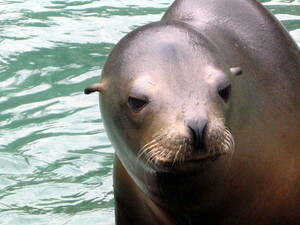 The Prospect Park Zoo on Friday, where the California sea lions charmed an admiring cross-section of Brooklyn. A cool and competent-looking Daughter was on duty at her volunteer job; over the summer, in this zoo of intimate scale, she has forged a deep empathy with a number of unlikely creatures. Her favorite, the inscrutable Slow Loris, lives in too much darkness to photograph. But she is also fond (who isn't?) of the zany meerkats. As daughter helped little kids stencil their favorite animals, I peered up into the Great Horned Owl's lair. This guy stared down at my face with implacable fury, as if my nose were a snack but for the glass between us. Nearby, these cockatoos cuddled like living Peeps. In the petting barn, Daughter loves the simplicity of this "Baby Doll" sheep named Ginger, a stumpy blob of grubby fleece. And, incredibly, she has forgiven Loki the Alpaca, who gurgled and then spat squarely on her nose on her first day of work. Mother has not forgiven, you sneaky sleazeball. When Daughter got off work, we nabbed a bag of Popeye's chicken, ate it in the park, and walked home on a perfect late-summer evening. Missed a park visit Thursday, for the usual dumb reasons. Now that it's colder, more willpower is required. To tide ourselves over, here's a fine undated photo (1940s? 50s?) 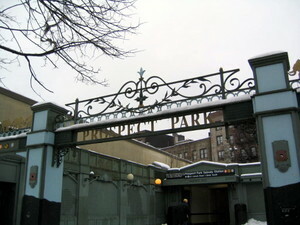 of the Prospect Park Zoo in its rather woeful middle incarnation (after the Victorian menagerie had been replaced by the current WPA-era structures, but before its 1993 renaissance as a humane, education-centered delight). So for minimum wage, a whopping $1.25 an hour, I cleaned tables, prepared food and watched the thousands—blacks, Puerto Ricans, Hasidic Jews, ethnic whites like myself—pour into this Depression era zoo on hot weekends because they had nowhere else to go. With their kids running wild, they would stare at the two pathetic polar bears or the unlucky seals in their pool or walk through the stench of the monkey house where an old Parkie would whistle and one mischievous monkey would hurl a piece of apple at the people. He rarely missed. He was the good one. The bad monkey pissed on the visitors. 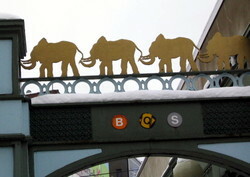 Rebuilt in 1935, the zoo was like Noah’s ark, only sad. The piece deepens into a wise, funny, and poignant sketch of a lost time and place, much rougher in some ways (certainly on the animals) but far more civil in others. *(Mr. Nolan walks the walk when it comes to Brooklyn nostalgia, not least as a staunch supporter of Holy Name, his old Catholic parochial school, now attended by our daughter.) The story is on a site of non-fiction tales called Mr. Beller's Neighborhood that is new to me, but I will be returning there often. Like Nolan, I come from Irish forebears for whom "a story never loses." 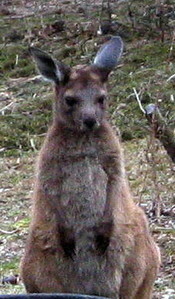 How did it escape my attention that there is a Brooklyn-bred baby kangaroo in the Prospect Park Zoo? 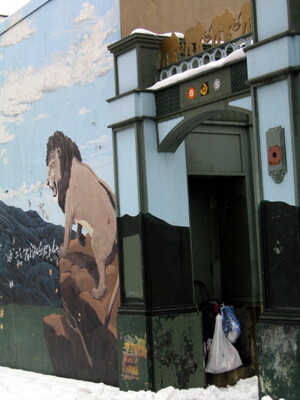 Thanks to Gowanus Lounge for alerting us to the naming contest for Pal Joey here; I have submitted "Willink," after the Dutch farmers who owned the land hereabouts. (No word yet on whether the baby, who emerged from Mom's pouch last December, is a boy or girl.) 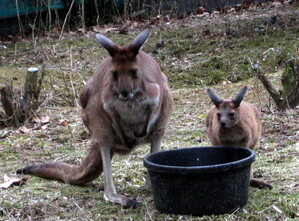 On today's visit, the little shaver spent most of its time with its head in the chow bucket; the 'roos here are basically hopping around right in front of you, a few yards behind some light fencing, with only a mutual respect for the social contract keeping them apart from their human observers. 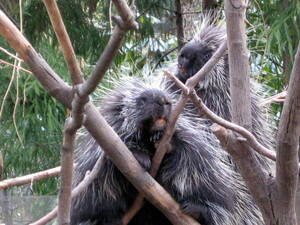 Nearby, the porcupines were splayed in Jabba-the-Hut-like splendor; one companionably scratched the other's back, which is quite a trick if you have quills. This shot inspired Child and myself to craft our first contribution to our cheap daily fix of idiotic cuteness, I Can Has Cheezburger. If you haven't had the Cheezburger experience, well...it's, um, funny pictures of cats and walruses and stuff, with babytalk captions in fractured syntax. Like this. Hey, if this week has taught us anything, it has taught us that there are worse ways to get your kicks than "LOLcats"! This morning was apocalyptically dark...thunder in January? Between bouts of torrential rain, I decided to check out some denizens who like it wet. 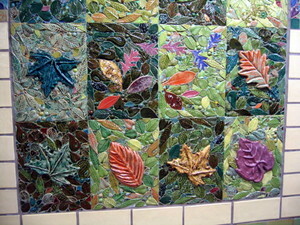 En route, I walked along Flatbush Avenue and gazed into the deep woods on the park's eastern border. 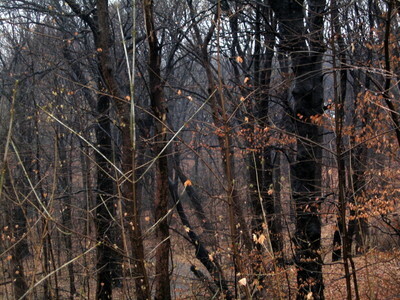 Well, they seem like deep woods, until one spies a car flickering past on the East Drive. I could have entered through any one of a half-dozen breaks in the fence to well-worn shortcut footpaths (I believe they call these "desire lines"), but it looked a tad deserted. Okay, as deserted as Mordor before the Hobbits got there. Sylvan isolation in the Catskills, say, is without menace (unless you have watched too much Blair Witch Project); in the city, it still gives me pause, no matter what ComStat says. Ah, but some folks were having a grand day already. 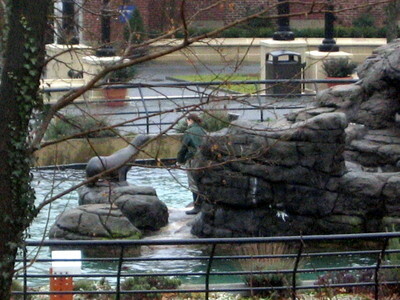 Here, hours before opening, was a sea lion and his keeper in the Zoo (easily visible through the fence), polishing up the act with the old morning bucket o'herring. Several young ladies were already waiting on the whiskery dudes before most of us were at our desks; somehow, I was put in mind of long-suffering admin assists fetching coffee for a barking boss. (A boss who had to point his flippers the right way before he got that cuppa joe, however.) CORRECTION: An astute reader points out that the sea lions at PPZ are all female...so make that "The Pinniped Wears Prada." * Nature walk. Saturdays and Sundays, 3 to 4 p.m., from the Audubon Center; look for birds and the source of the Lullwater with a naturalist guide.